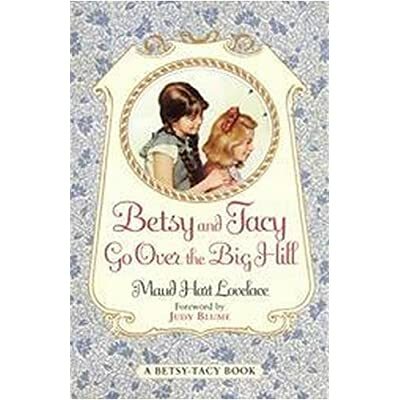 Discovering Betsy-Tacy #3: Betsy and Tacy Go Over the Big Hill – my books. my life. I enjoyed this book a whole lot more than the first two books. Instead of simply some nice little stories packaged into one book, this one actually had a plot. Betsy, Tacy, and Tib have turned 10 and their book is growing up as well (they do have two numbers in their ages after all). At the beginning of the book, they fall in love with the new, young Spanish King. But this facsination soon turns into crowning a queen of their own. Unfortunately, similar plans are being made elsewhere and a family fued is brewing. The result is, of course, a happy one for all and the adventure along the way is very entertaining. I absolutely loved Little Syria! I love the idea of a little middle-eastern town in the middle of Minnesota (is this part real?). The characters were wonderful and the lesson to young readers about tolerance and acceptance is important. This also seems way ahead of its time (I have a feeling this is going to be a theme). Given the way people view Arabs today, I have to imagine they were not well-received 100 years ago. Kudos to Maud Hart Lovelace for writing this. I also learned (from the back of the book) that the illustrator, Lois Lenski lived in Tarpon Springs, FL. My copy actually said that she lives there. Seeing as she pased away in 1974, I think my library has a very old copy of this book. Anyway, Tarpon Springs is the town we lived in when we first moved to Florida and the town where Ben still teaches high school. It’s always a little fun to learn facts like that. I also learned something about myself. I should not check two books in a series out at one time. First I started reading Betsy and Tacy Go Downtown before I realized that was the fourth book. Then I accidentally returned Book 4 when I meant to return Book 3 and I had to re-request it. I’m still hoping to tackle the next two books this month as part of the Maud Hart Lovelace challenge. The Readathon should help. Thanks for joining in the MHL Reading Challenge! I enjoyed your review. And yes, Little Syria was real, though under a different name. It reappears in the Deep Valley story “Emily of Deep Valley” which takes place in 1913. Also, Maud used some of the information to inspire the story “The Trees Knelt at Christmas” — both of these books I read, enjoyed and reviewed, so check out the reviews if you’re interested to learn more.